This recipe comes from my good friend and chef, Joshua McFadden’s cookbook Six Seasons. 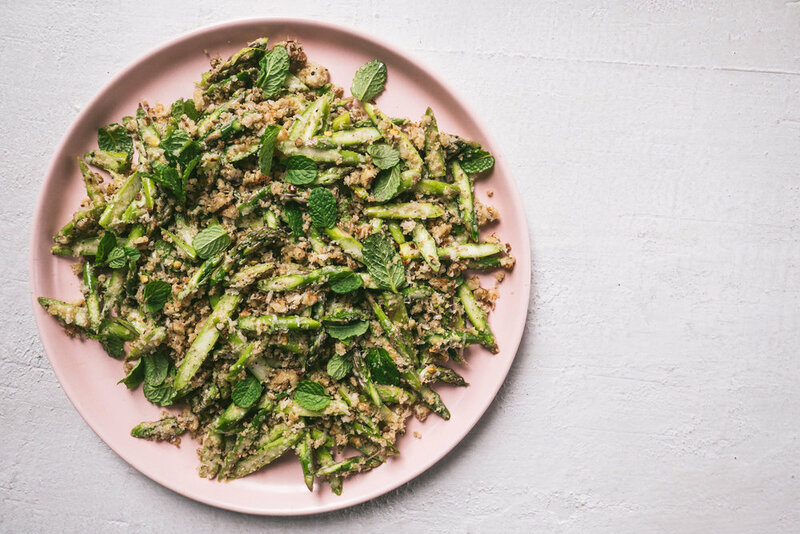 It is a mix of raw, but please only super fresh, asparagus, salad, breadcrumbs, parmesan, lemon juice, red pepper flakes, walnuts and mint. And it’s absolutely delicious. 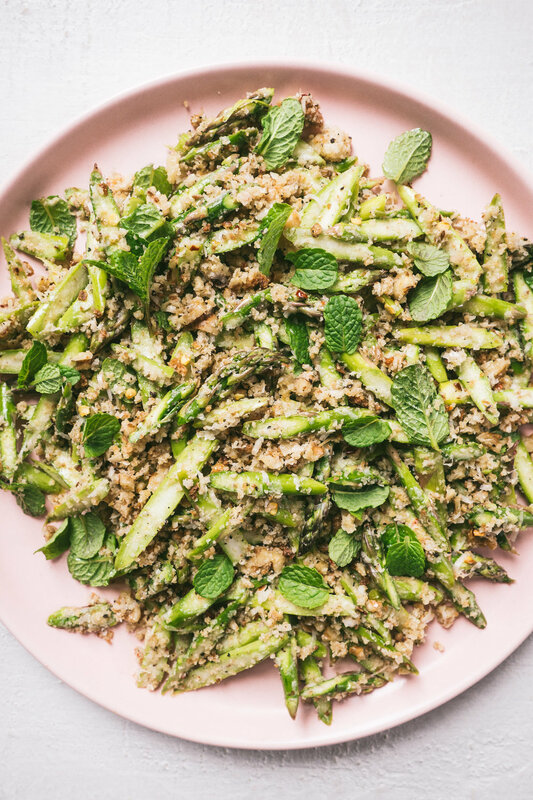 Make your breadcrumbs ahead of time and this salad comes together in five minutes. When asparagus is at the market, freshly green and crisp, it is actually my favorite to eat raw, and simple. Give it a try in this recipe! Put the breadcrumbs, cheese, walnuts, and lemon zest in a large bowl, along with 1 teaspoon of salt, some black pepper and a small pinch of dried Chile flakes if using, and toss together. Cut the asparagus on a sharpie angle, creating thin slices and add to the mixture. Toss in the lemon juice, and then taste. Once the flavors are where you add then, THEN add the olive oil and mint. Give one more taste, and serve. You can use any bread here, but I like a nice loaf from your bakery here compared to sandwich loaf bread. Cut the bread into 1/2” thick slices and then cut into cubes. Spread on a baking sheet and place in the oven at 250 degrees. Let the cubes slowly bake for about 1 hour, possibly more. You don’t want them too browned, but do want them crisp. Allow them to cool, and then toss them into your food processor. Give it a few whirls until you have a variety of small pieces. The breadcrumbs can be stored in an airtight container for a few weeks. Use as croutons, use for meatballs, use for anything that you want a little extra crunch on. Heat the oven to 350 degrees. Spread the nuts onto a baking sheet and place in the oven for 6-8 minutes depending on the size of nut. Remove from the oven, and off of the baking sheet. Allow to cool.